We might add another factor, which is that companies are getting more focused on Green programs that are very clearly defined and which have a solid financial payback while improving Sustainability. We’re just catching up with the annual Sustainability in logistics report from American Shipper magazine, co-sponsored by eyefortransport, CSCMP and NRF. The report, releaseD in Q1, is based on interviews with some 200 shippers and 3PLs (3PLs represented 32% of the respondents; the rest were spread over a wide range of industry sectors). But to us, a surprisingly large percentage of companies are willing to invest in Green with no ROI. As shown in the chart below, in 2011 a combined 67% of respondents said they would pursue Green efforts that would be just cost neutral at best oR actually deliver some hit to the bottom line. That combined number fell to 60%, however, in 2012. Is Green Becoming a Decision Criteria? This year’s data says that Green considerations are growing in importance, especially relative to 3PL selections, but are far from dominant in decision making processes. 43% of respondents report that they are now asking logistics providers for Sustainability programs in the course of RFPs, up a bit from the 38% seen in 2011. Like last year, large companies are considerably more likely to consider Green factors in 3PL selection than smaller firms. Overall, 43% of 2012 respondents say that Green-ness is an important or tie-breaking factor in 3PL selection, up from 36% in 2011. 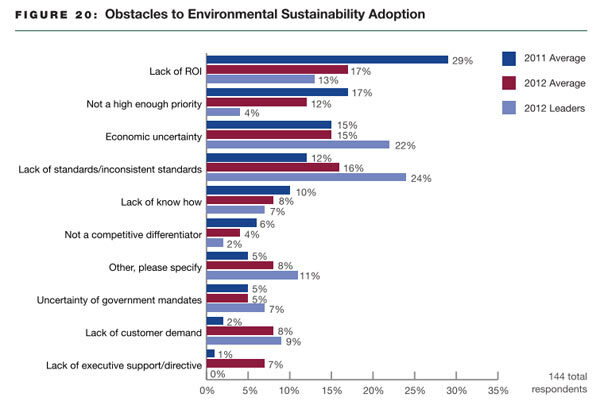 Finally, the report looked at the barriers to adoption of Sustainability initiatives. As shown in the graphic below, lack of ROI not surprisingly was cited as the largest obstacle, though the percent citing ROI as the barrier dropped from 29% in 2011 to 17% in 2012. Lack of standards or what are perceived as inconsistent standards are also rated as an important barriers to Sustainability initiatives. In looking at the data in total, the report says that “the importance of “green” has not yet become a key factor in making a choice between two equally qualiﬁed carriers. “Green” initiatives are not affordable across the board, so small and large companies will have well deﬁned “Green” avenues, while mid-sized companies will continue to seek a balance between affordability and scalability of Green measures." Any reaction to this study on Sustainability in logistics? Let us know at the Feedback button below.